MPP students got the opportunity to explore careers in Detroit over fall break through a trip sponsored by Graduate Career Services. On Tuesday, October 16, around 25 Ford School students gathered at the U-M Detroit Center, at the southwest corner of Woodward and Mack, for a day of panels and conversations centered around exploring potential internships and jobs in the city. The morning began with a panel focused on the topic of data in public policy. This panel featured five professionals working in the public and nonprofit sector in Detroit, offering career and program perspective from each of their respective employers: City of Detroit Department of Innovation and Technology; Detroit Public Schools Community District; Community Foundation for Southeast Michigan; Detroit Police Department Crime Intelligence Unit; and the Ralph C. Wilson, Jr. Foundation. The panelists conveyed the importance of metric-driven policy within their work, including successfully using data to tell a story and instilling a culture of data across the organization. Each panelist echoed that when implemented in a strategic and responsible way, data and emerging technologies can help produce better outcomes and increase efficiency in public policy, particularly in resource-scarce environments like non-profits and cities with declining populations. The second panel offered the perspective of leaders in Detroit’s private sector and how their organizations aim to impact the community while staying within their companies’ missions. The guest panelists represented Quicken Loans Community Investment Fund, JP Morgan Chase Global Philanthropy, General Motors, Blue Cross Blue Shield, and Henry Ford Health System. Detroit's well-documented network of corporate support for civic capacity was a recurring theme of the discussion. One student asked about the policy implications of corporate philanthropy playing such a crucial role in public decision-making. Panelists responded by sharing examples of common public-private partnerships in Detroit, highlighting the importance of leveraging each other’s efforts in addition to integrating community feedback into their policy, in the hopes of creating robust and impactful change within Detroit’s communities. Ford School alumni joined the students for lunch, providing time for students to hear from a range of working professionals playing an active role in the Detroit policy landscape. The inquisitive nature and enthusiastic engagement of the alumni helped students’ internship plans to take shape. After lunch the group took a bus tour starting down Woodward to the riverfront, and then up East Jefferson into the group of neighborhoods known as the Villages. While time did not permit a tour that could show the full expansiveness of the city, it allowed students—especially newcomers—to get a better sense of a few communities. DeAndre Calvert, the community engagement manager at the Ford School’s Program in Practical Policy Engagement, which cosponsored the trip, led the tour and provided context for the lower east side. The absolute highlight of the trip was the visit to Church of the Messiah at the northwest corner of East Grand Boulevard and Lafayette. Pastor Barry Randolph and his passionate team of servant leaders welcomed the group into their unassumingly beautiful building with bustling activity in every corner. In addition to the Sunday congregation, the Church of the Messiah hosts a custom bike repair shop and the production of Nikki’s Ginger Tea, among other activities, that encourage creativity, the entrepreneurial spirit, community building, and create jobs for residents of the neighborhood. Finally, a panel of neighborhood leaders gathered in the sanctuary to deliver the final panel of the trip. This neighborhood panel offered a tremendous display of passion and wisdom, with leaders from East Village Association, Church of the Messiah, Detroit City Council, The Villages Community Development Corporation, and the City of Detroit Planning and Development Department. The panelists expressed a range of visions of a better Detroit, stressing how policymakers can respond to the city’s current political and fiscal challenges. Panelists noted the need to create opportunities for the community’s voice to participate in major decisions. Equitable development and impactful revitalization will only occur as the result of sound public policy that prioritizes community outcomes, targeting major socioeconomic issues, and policies benefiting longer term and new residents alike. In the field of public policy, Detroit presents an incredible opportunity to affect positive change for citizens, showcased on the trip. The enthusiasm and innovative mindset of the professionals present on the panels and the networking lunch solidified the decision to apply for internships in Detroit for many students. 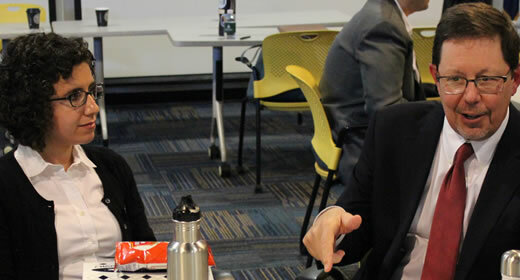 By connecting students with networking opportunities in Detroit, the Ford School aims to develop leaders that apply problem-solving mindsets in an interdisciplinary approach, many of whom, will join the growing number of Ford alumni in further fostering an atmosphere of inclusion and innovation within Detroit. For more information on U-M’s collaborations in Detroit, please explore UM’s Detroit initiatives, including Poverty Solutions, which is housed at the Ford School. -Written by Jonatan Martinez, Nick Najor, and Eric Hanss, the 2019 David Bohnett Leadership and Public Service Fellows.